Well...great things happen when you lead from the heart! The details below outline my group coaching program. One on One coaching is of course, much more hands on and can have much faster results. Consider today the day that you officially give the world your notice that the 2.0 version of you will be introduced very soon. I created this program to give you an opportunity to own your voice, define your message, find the stages that you desire to speak on, craft and prepare your idea worth sharing, so that it lands with impact, pitch to speak, and repurpose your content to serve as a guest speaker and writer on various platforms that align with your message and goals. You also get an opportunity to take a journey with me and learn as I learn, while also receiving feedback on the differences between a TED and a TEDx talk and crafting your talk for both platforms. This is your back door. There's a common phrase that says, "Success is about who you know." Well, I am eager to expand your network. THE FIRST MONTH BEGINS WITH AN INTRODUCTION TO PLANNING YOUR INDIVIDUAL GOALS. You also begin to learn to craft your signature talk and core stories to infuse into various talks that you may give. One of my favorite parts of MONTH 1 is definitely the individual pitch list that each speaker receives. 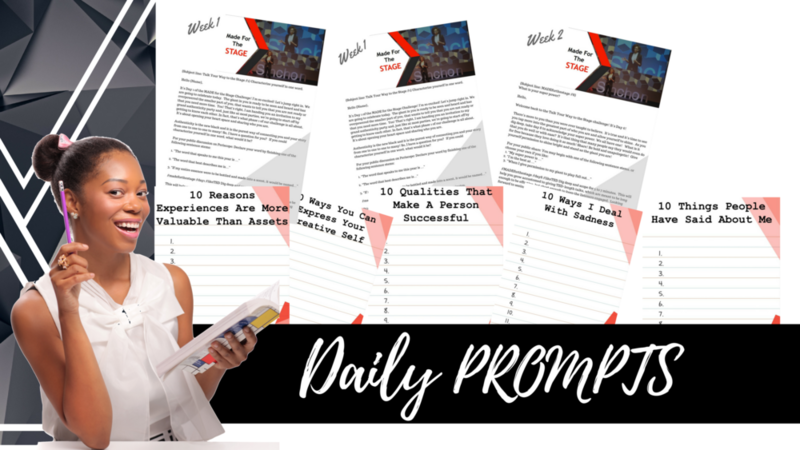 You also receive daily email prompts sent to you immediately upon joining and directions on ways to podcast or utilize live streaming to begin to practice owning your voice, and building the best community for your new message along the way. You also receive a guide book (Talk Journal) to help you to gather feedback and process the blocks that you are able to break through as you hear yourself begin to become more familiar with the story that drives you at this moment. This is a powerful process and it's definitely my favorite part of the journey. We will dive in to write your talk, as well, and if you are ready to pitch in this month, we can begin the pitching process. Why wait if you're ready? The great thing about month 2 is that this is when you truly have the opportunity to grow and become more comfortable with your message, while also receiving high-level feedback. You have the opportunity to play around with different pitches to practice your angles. You also receive training on how to create videos and share the topic of your talk in less than 1 minute. All the while, you will continue to pitch and dive into the goals on your pitch plan (Formed in month 1). As your message evolves, your pitch plan may evolve as well. And that's totally fine! 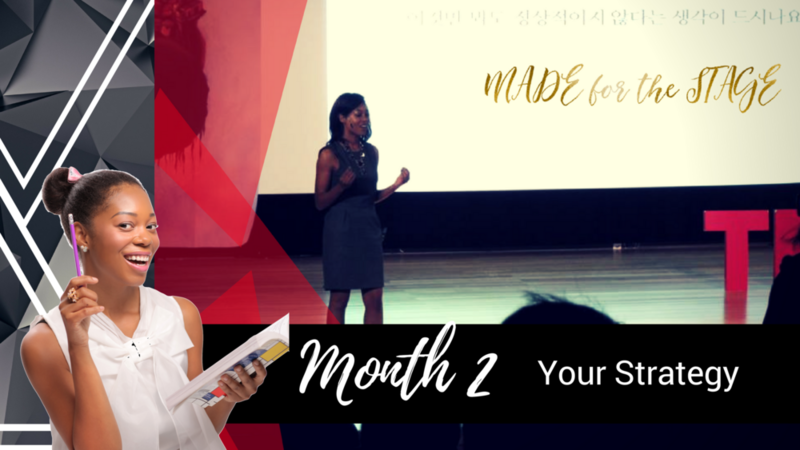 Month 3 is all about pitching and preparing your happily ever after. You are provided with coaching on ways to connect with guest blogs and podcasts to spread your message even further. You are also provided with a database of hundreds of individuals who are specifically interested in sharing your message on their blog or other forms of media, their direct contact information, and examples of their best content so that you can provide a pitch that gets a solid, 'YES.' In addition to your personal package, you are still pitching to several stages, speaking on the stages that you have landed on, and working with Gahmya on ways to continue to further craft your message and delivery. Because many individuals notice that their messages and talks evolve, you will receive another stage and pitch plan similar to the first month. This may result in your first, second, or even third talk! If your first core signature talk is solid, then we dive into creating more. You're full of stories, once you build the muscle that helps you to dive and connect the river of your truth to nourish the messages of your legacy, you share messages that land and impact in the way that serves you most. Investment: The Fee for one-on-one coaching is $4,000. However, the Insiders Discount (For close friends and family-before October) is $1,997. I don't coach more than 2 people at a time and there is currently one spot available. LEt's get started! Q. When is confirmation and payment due? A. Please confirm and submit payment by March 1st. This allows time for a waitlisted individual to be provided with the opportunity. Q. I'm not really ready to give my TEDx or signature talk now? Should I wait? A. You could wait. However, the dynamic of this program is so powerful. The momentum that it builds really empowers you. You will also have your Signature talk completely ready to deliver whenever an opportunity does come your way. I personally keep a talk handy. When I travel internationally, I often speak on stages that have last minute cancellations. Also, please know this: you do not need to be famous, have a large social media following, or be 'well-known' to be selected to give a talk. A great talk is a great talk and we know that you have a powerful message inside you! Q. Can you guarantee that I will be selected to give a TEDx, TED talk, or selected to speak at a university? A. I cannot make any guarantees that you will be selected for any stage. However, I will pour as much into you as possible and give you tools that you need to be successful. You got this! A. Because of the early vetting and digital nature of many offerings included in this course, you begin to receive value immediately! However, you may receive a full refund within one week of payment for the course. As far as completing the course/coaching, we understand that “life happens,” so you have 6 months to complete the course/coaching experience. There are no refunds if you never fully complete the coaching experience. Disclaimer: TED is a registered trademark of TED Conferences, LLC. MADE for the Stage: The TEDx Game is a program by Evolved Teacher. It is not endorsed by, sponsored by, or affiliated with TED Conferences. This is an educational program that does not guarantee that you will speak on a TED or TEDx Stage. You are responsible for the effort and participation that you put in to reach your public speaking goals. It is our goal to assist you with this process and provide you with the knowledge necessary to shine your light and share your message with the world.